A certain social media site reminded me this week about a five year memory of my trip to the Goat Rocks Wilderness in Washington and offered this photo. It was just a two day backpacking trip but it was a good one. 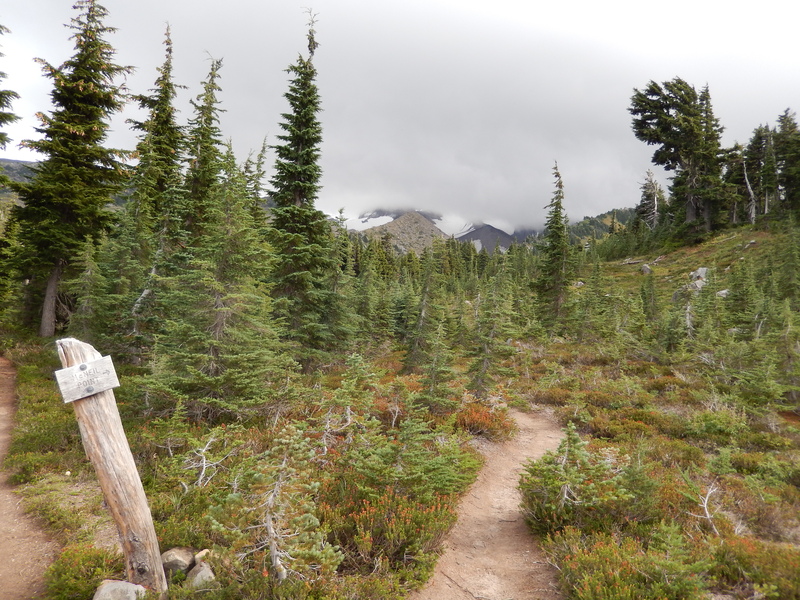 I hiked in and camped in a clump of trees on the edge of gorgeous alpine meadows. The second day was one of the best days I’ve had scrambling in a stunning setting, peeling off of the PCT to bag both Old Snowy and Ives, with plenty of rock hopping along the way, including a sketchy talus slope traverse. Good memory. Thanks, Facebook. I need to return. 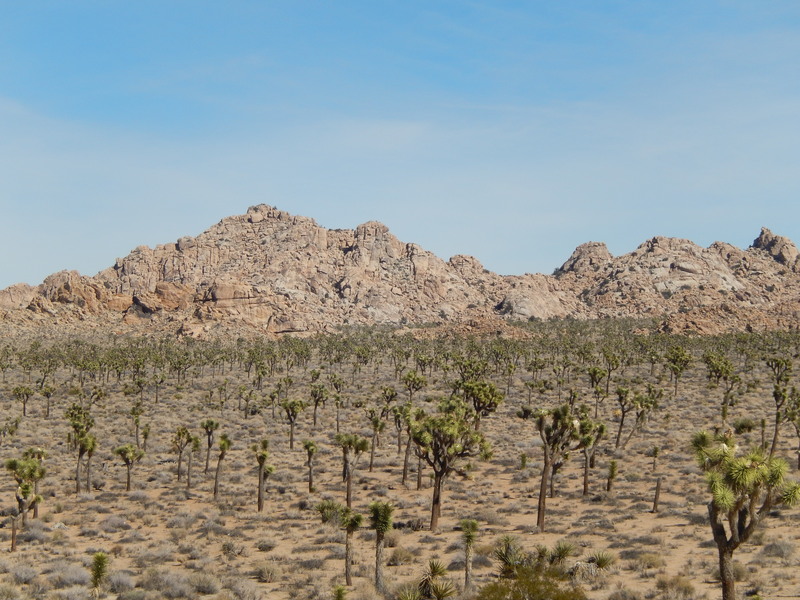 Since I first heard of Joshua Tree National Park in the eighties, I have wanted to visit there. Well, duh, it’s my name, I love to climb rocks, and U2 was one of my favorite bands in the mid 80s when they came out with their breakthrough Joshua Tree CD. It seemed a destination carved in the stars. Why it took me decades to get there is one of the many mysteries of my life, but I finally went there last week with my wife and our dog, Jackie Chan. I was not disappointed. 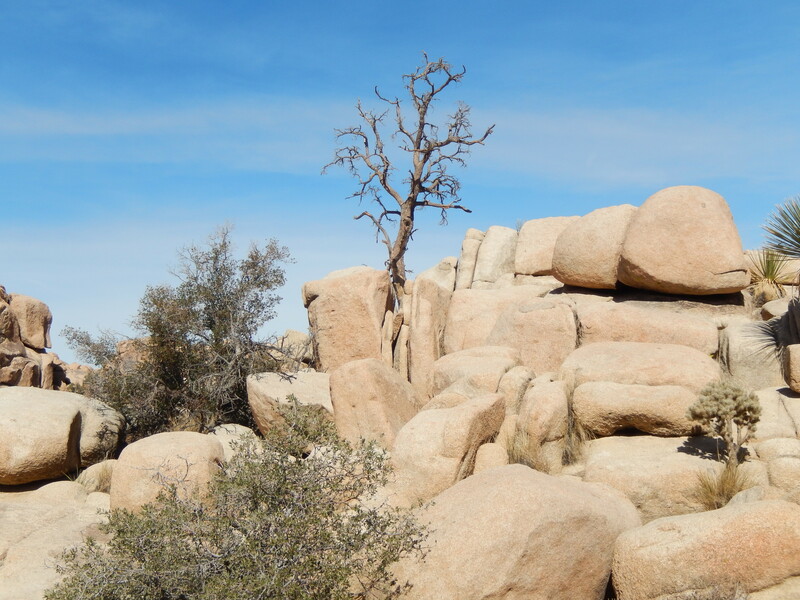 J Tree, as many climbers call it, features the boundary of two great deserts, the Mojave and the Sonoran. The first is relatively high in elevation and features the park’s namesake trees. 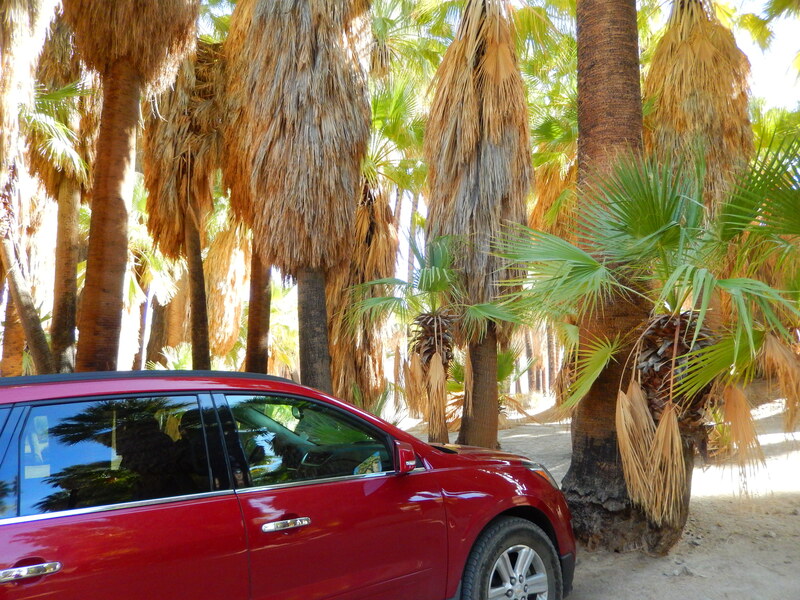 We approached from the north after gaining a significant amount of elevation on the road through Yucca Valley. 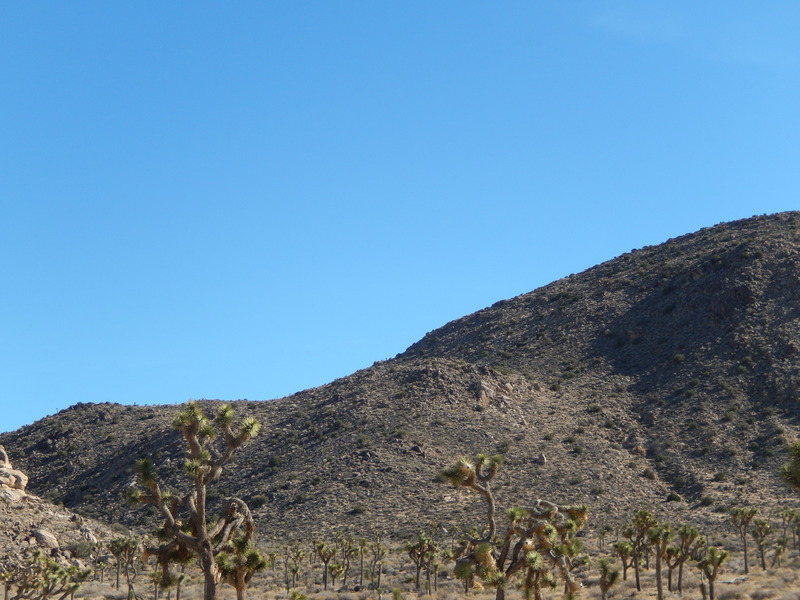 I wanted to smile when I started seeing Joshua Trees, AKA yucca brevifolia. The rocks were not yet dramatic, but finally the outcroppings popped up more and more often until their rounded granite domes and crags seemed ubiquitous. We stopped at a picnic area for a first taste of the rocks, and then we made our way to the famed Hidden Valley area, so named because supposed rustlers a century ago or more would hide their stolen beasts amid the chaotic jumble of rock which would deter most people from finding them. We started seeing climbers carefully scaling a few of the crags, rope snaking upwards, and I was nostalgic for my climbing days. Scrambling sans rope on a small boulder is fun, but it does not produce the same thrill as climbing a vertical face 80 feet high. Ah, well. 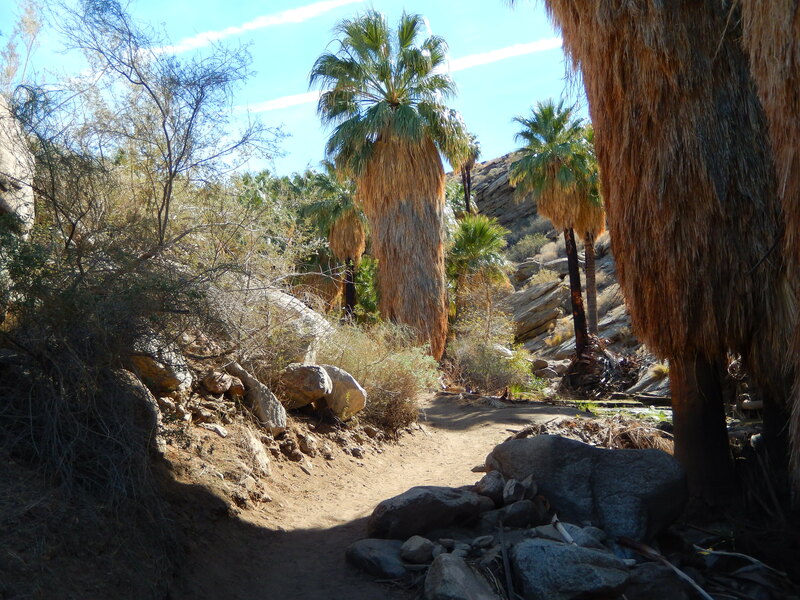 The trail was a loop winding around the interior of the so-called valley. After a while, it became very difficult to orient myself. There were hundreds if not thousands of house sized rocks to pass. Luckily, the path was easy to follow, and the sun was out, gloriously warm. I was actually surprised at how few climbers we saw, but I guess it’s an odd time of year for some people. March through May might be prime time. 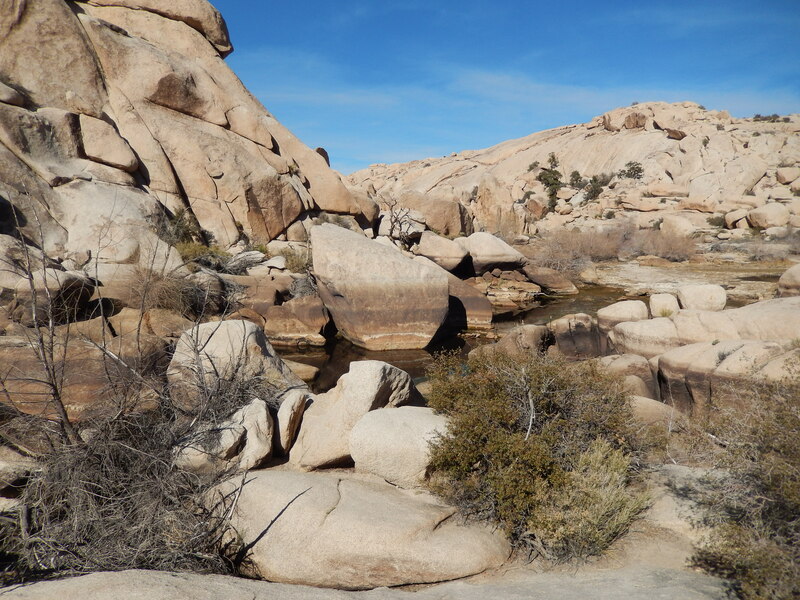 After leaving Hidden Valley, we drove nearby to the Barker Dam trail, where locals augmented a natural water source with a dam to save water for their cattle in the early 20th century. The trail was similar to Hidden Valley, but more wide open in spots. On the return leg, we encountered a rock with petroglyphs. Unfortunately, some movie studio geniuses marred the images by painting over them to make them more visible. The petroglyph rock. Can you see them? At this point, we had done enough hiking for while, and I thought driving to Key’s Point, the highest point in the park, would be a nice change of pace. 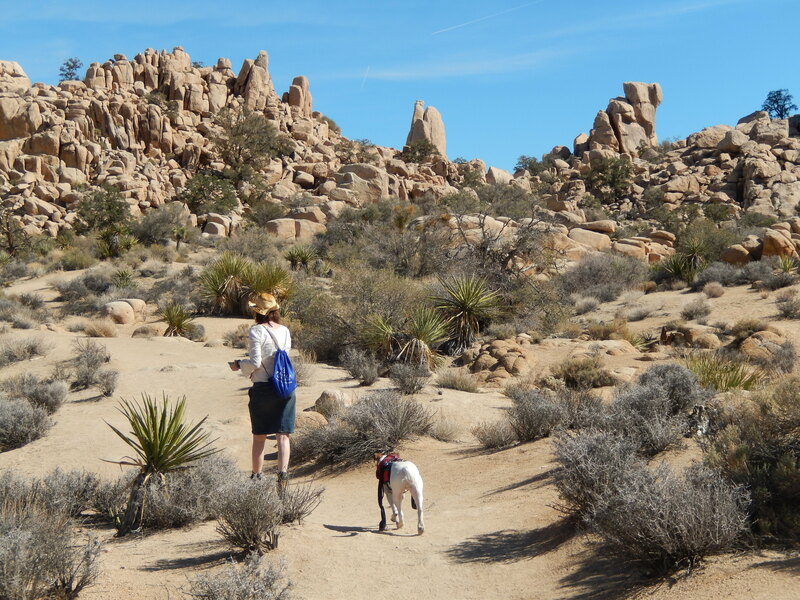 On the way up, we saw some great stands of Joshua Trees. The golden rocks faded away. The land sloped upward. On top, there was a big parking lot with a dozen or more vehicles. The views from the short paved path were stunning. 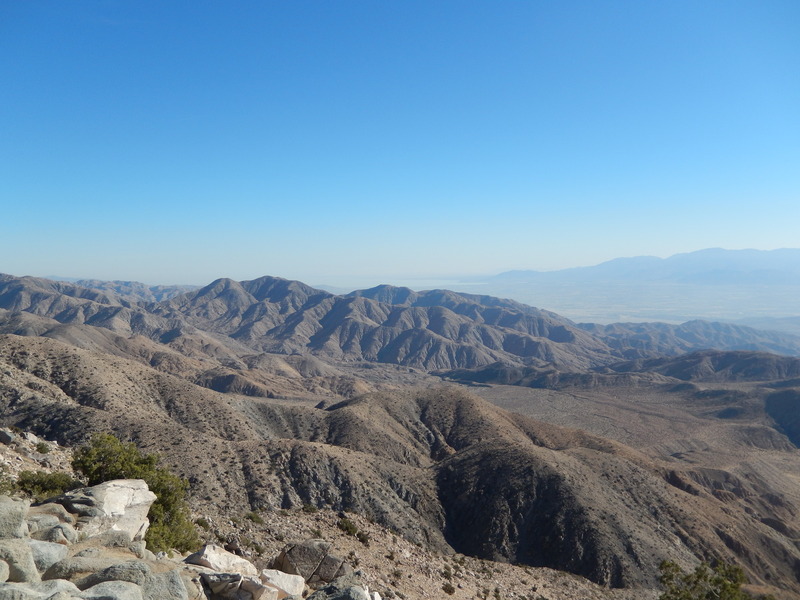 Rumpled brown ridges fell away in all directions to the low desert and the Salton Sea beyond. Dozens of people milled about, gawking and talking, pointing at views and posing for photos. We drove away from Key’s Point, already amazed the by scale of Joshua Tree. I could spend days here hiking and scrambling and working on a tan. Unfortunately, that was not in the cards for this trip, but we weren’t done yet. There would be more to come. 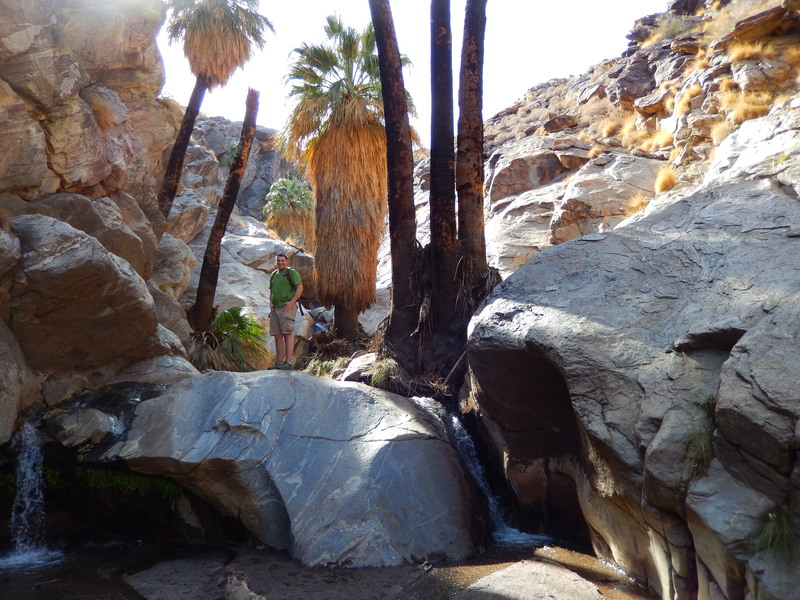 Tune in next time for more images and tales about Joshua Tree National Park. 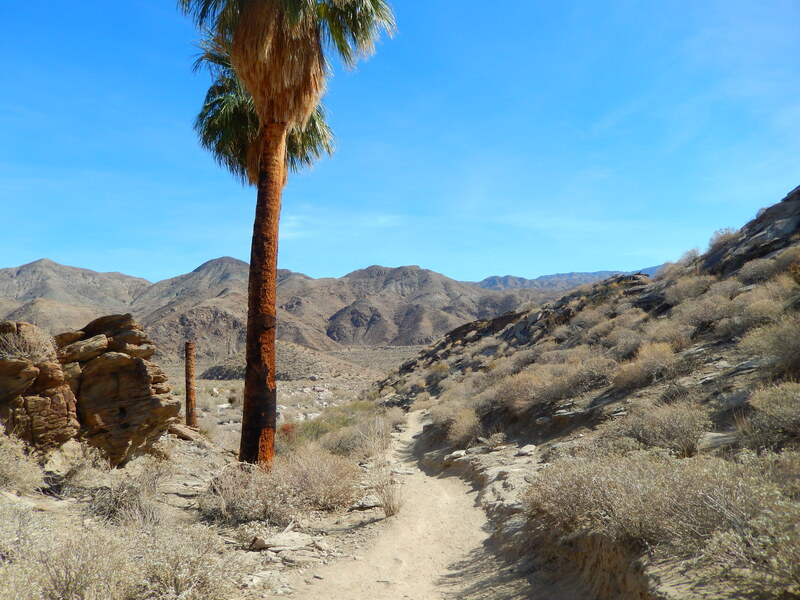 When my wife and I drove to Bob Hope’s old stomping grounds in Palm Springs, I arranged to meet my friend Evan for a hike. I knew it would be a far cry from anything in the Northwest due to the combination of precipitation that needs to be measured over years, and the abundance of palm trees. When we arrived at the parking lot which serves as trailhead for Murray Canyon and Andreas Canyon, it felt like I was on the set of The Flintstones. 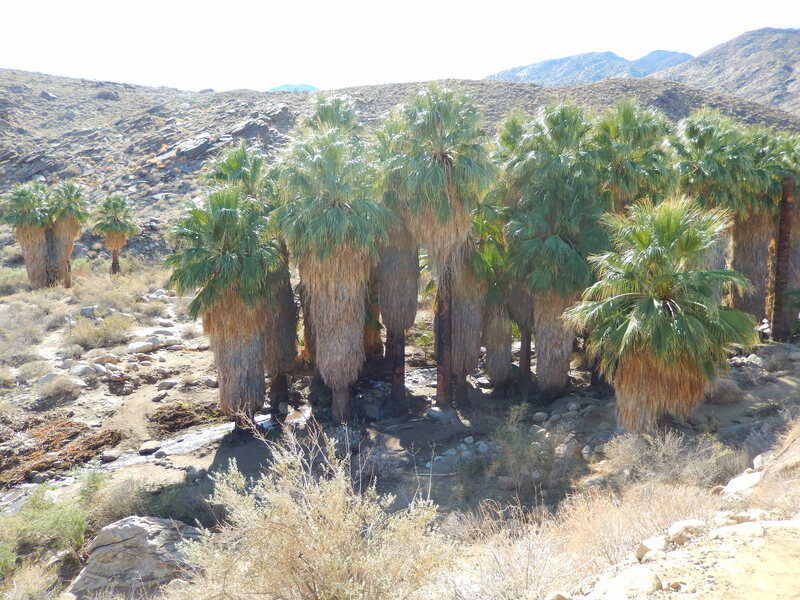 The palm trees just seemed like something out of another era in botanical history when trees had beards. The hike started out casually across the sandy desert, skirting low hills. In all directions we had views of rugged, barren mountains and hills in varying shades of brown. Not the sort of place to be in August. Indeed, if it were hotter, the trail would not have been too pleasant, but 80 degrees in the sun felt fantastic to me. Plenty of people were walking, mostly coming back. Many seemed around retirement age and sported hats and wore sensible light hiking shoes. After a mile or so, the trail dropped into a canyon entrance that looked like a green daub from a paintbrush splashed across the landscape. 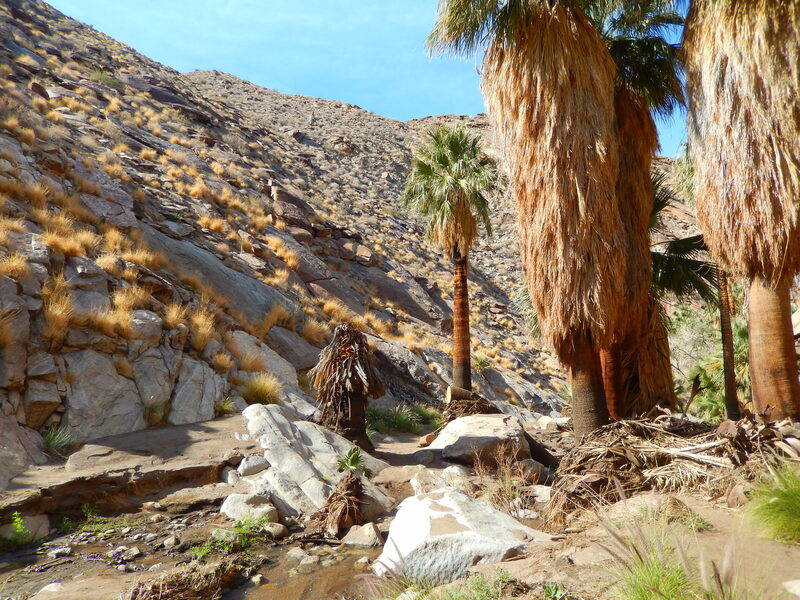 With tall palms lining a pleasant stream, it was a veritable oasis. Silt piled up on the banks suggested flooding in recent years. 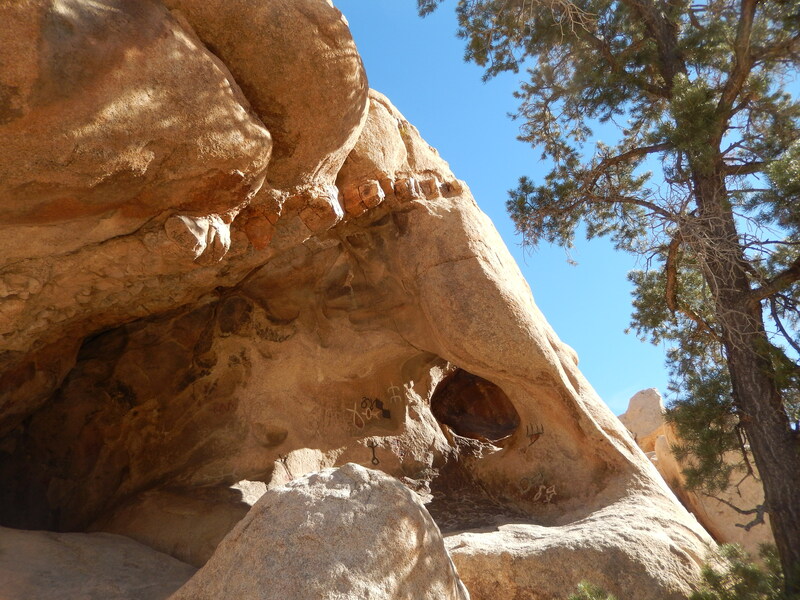 We followed the path upstream, crossing the stream a dozen or more times in the canyon’s winding course, hopping rocks, checking out the amazing cliffs and ridges that loomed above us. 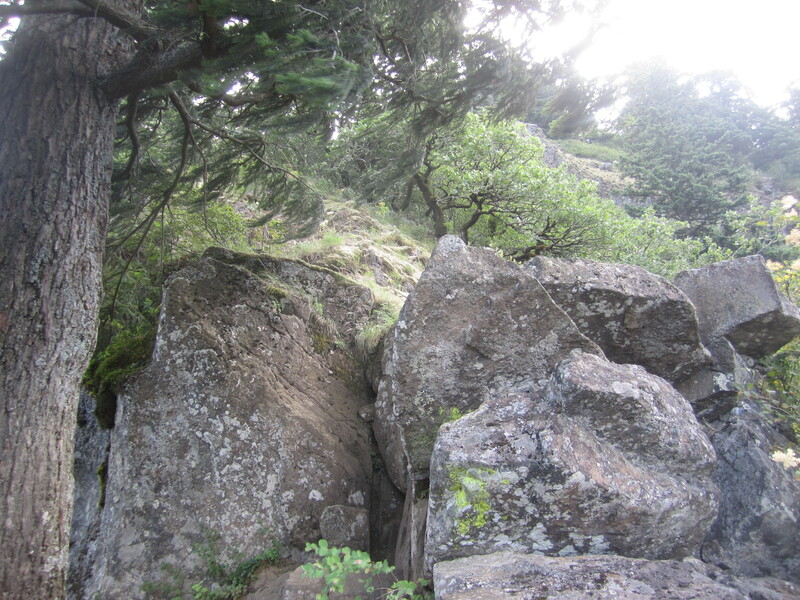 At one point, the trail rose fairly sharply over rock, then descended almost as steeply in an area that was quite exposed, meaning a slip on the ball-bearing-like dusty gravel would send one plummeting to injury or worse. The reward was the tighter upper canyon. 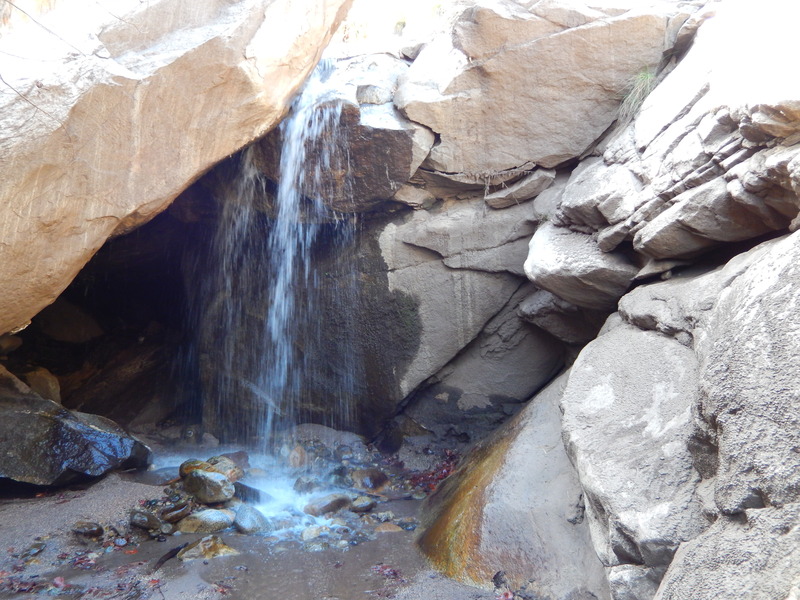 As it got narrower, there were a few spots where the trail went multiple ways, but it all funneled toward a series of small waterfalls, beyond which the way was impassable without technical gear. In the shade of the steep walls, the temperature was very pleasant. We poked around, sipped some water, snapped some photos, and enjoyed the setting. This is a great hike, and I felt bad for a couple women who stopped short where the trail got steep. In some places a handrail of sorts might be installed, but that generally detracts from the experience for me. A little scrambling in a couple spots lets you see more of the waterfalls. I would endorse this hike with a big fat thumbs up. 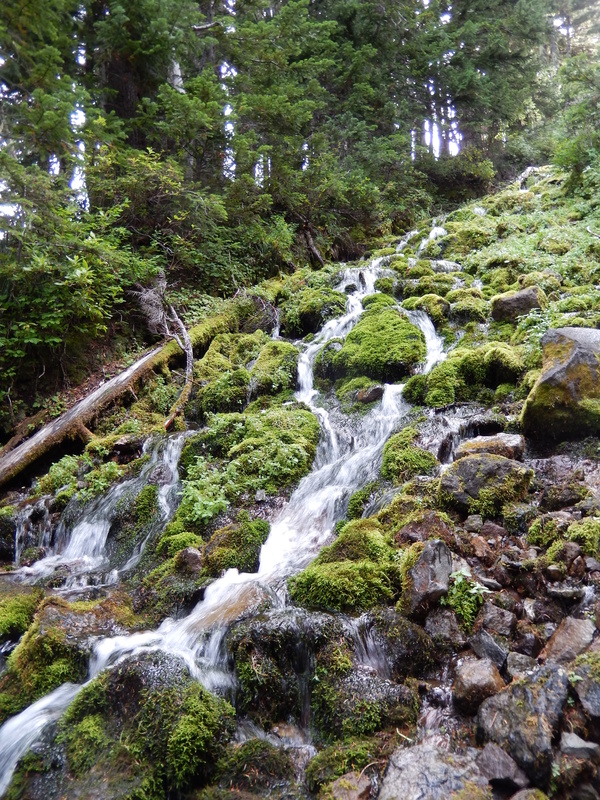 A hidden cascade below the steep section. 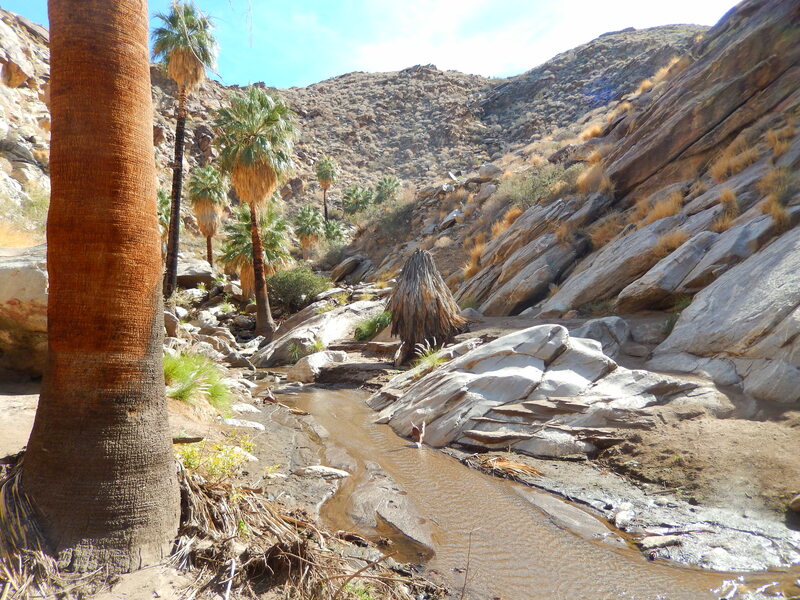 If you go, know that Murray Canyon is part of the Indian Canyons complex just outside Palm Springs. There is a $9 entrance fee per person. 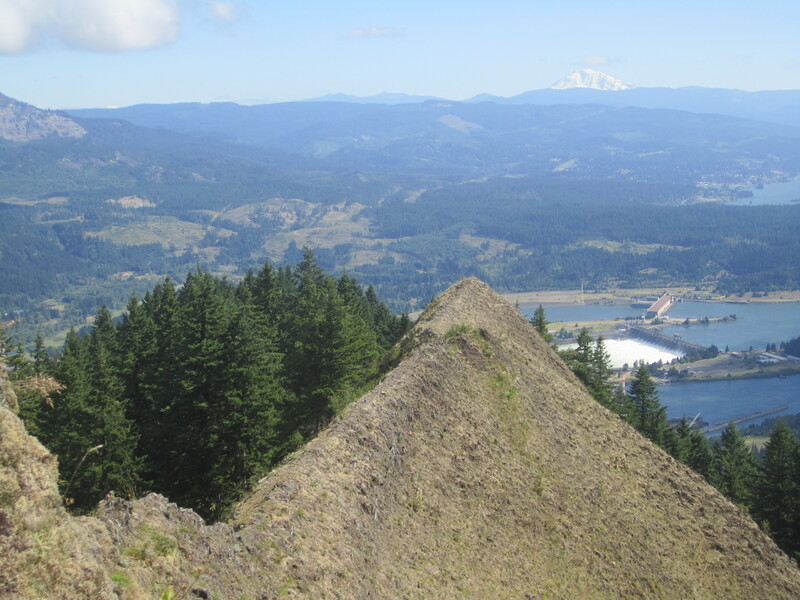 Just over twenty minutes after leaving the Top Spur trailhead, I reached one of the classic Oregon hiking viewpoints. Mount Hood looms large over the steep, bare flanks of Bald Mountain and the silvery strands of the Muddy Fork far below. There is barely a spot wide enough to get comfortable for a photo. The sun is in my face, so the first photos with my new Nikon don’t come out well. Soon I dipped back into the trees, but this sort of spot is always a good start to a hike. 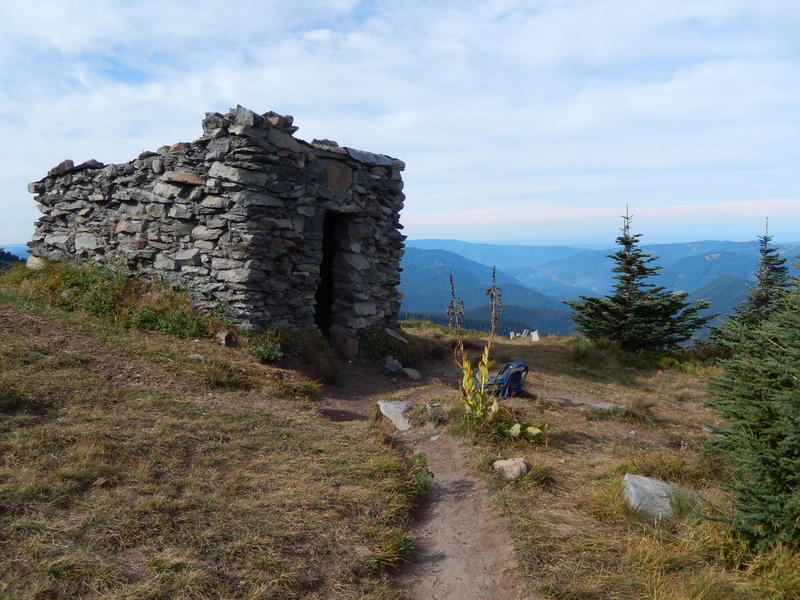 My destination was the old CCC shelter at McNeil Point and the alpine terrain above it. I’d been there a few times, but I’d never climbed above the shelter toward the upper reaches of Cathedral Ridge. The hike is casual for the most part. There are two great viewpoints along the way, one of which even has nice rock perches. The Timberline Trail doesn’t officially go to the McNeil Point shelter, but there is spur trail heading up there. 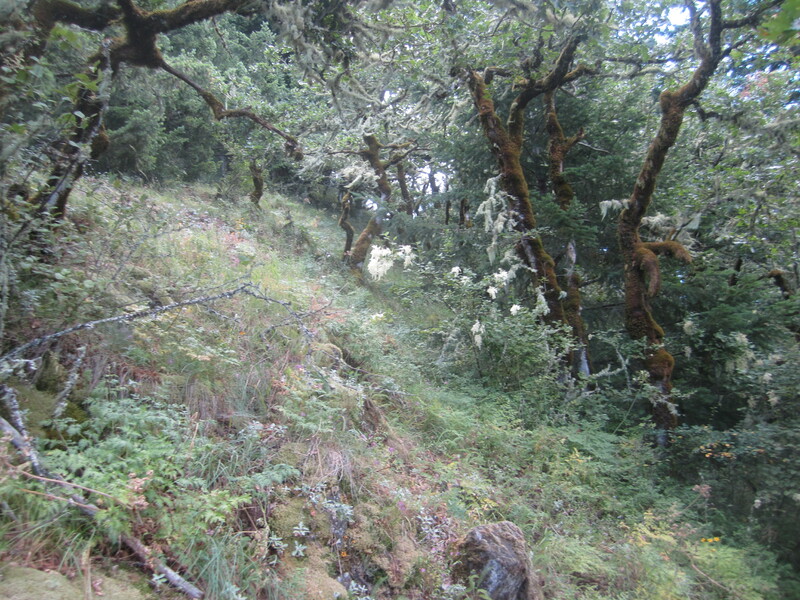 There is also a steep climber’s trail which takes off alongside a tiny creek. I missed it on my way by but found it after hopping across a rockslide. This is much shorter than taking the official trail, but it is also much steeper—not for the faint of heart. The shelter was as I remembered, a stone remnant of one of FDR’s stimulus programs. It is a great spot to relax and absorb the views, with the glaciers and craggy ridges of the mountain looming above, and views into the maw of the Muddy Fork’s canyon below. Across the canyon, the bulk of Yocum Ridge is enticing. To the north, Mounts St. Helens, Rainier and Adams are all visible. Upwards. A hiker’s trail headed up through the alpine tundra world. Vistas reminded me of the alpine scenes in The Sound of Music. Serious. I was feeling out of shape, so I took my time to snap photos and stay hydrated. The ridge was far more rugged than it had appeared from below, which is a good thing in my book. 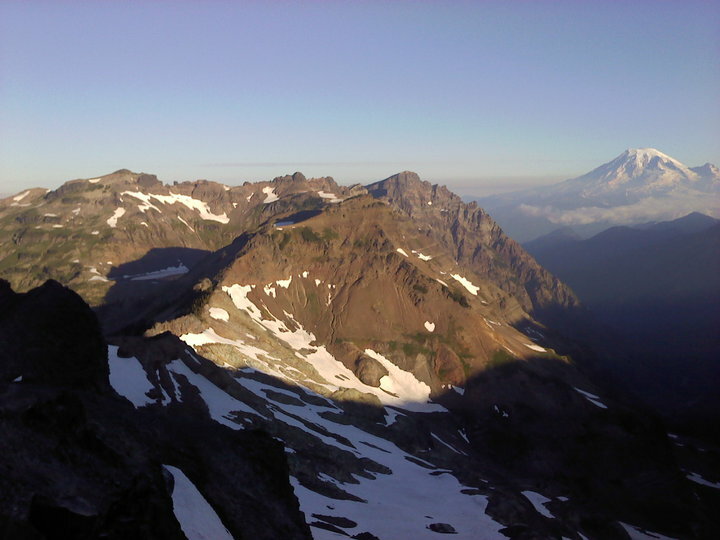 Tough scrambling was worth it to stare at the face of Mount Hood from this vantage. It might not be as tall as a lot of peaks, but it is, to borrow the old Columbia Sportswear ad, one tough mother. White wispy clouds gradually grew, and the skies slowly darkened. Time to get going. 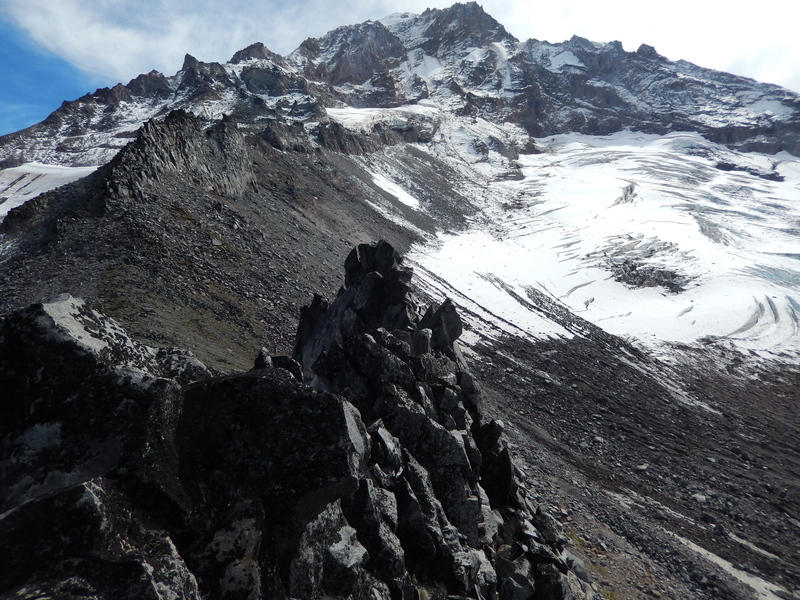 Other hikers appeared below along a grassy sub ridge adjacent to the Sandy Glacier. I wondered if they were on a decent path, and I decided it looked like a safer route down. Easy scrambling here. This looks much smaller in the next photo. When I descended, I found no trail, and the hikers had vanished. Some ridiculous talus slope hopping ensued. Rocks teetered underfoot and slid on the micro-pebbles beneath. It’s a broken ankle waiting to happen. In retrospect, this was not my best choice, but I didn’t want to lose too much elevation. Looking down the Muddy Fork drainage. Bald Mountain is the bare spot on the right. 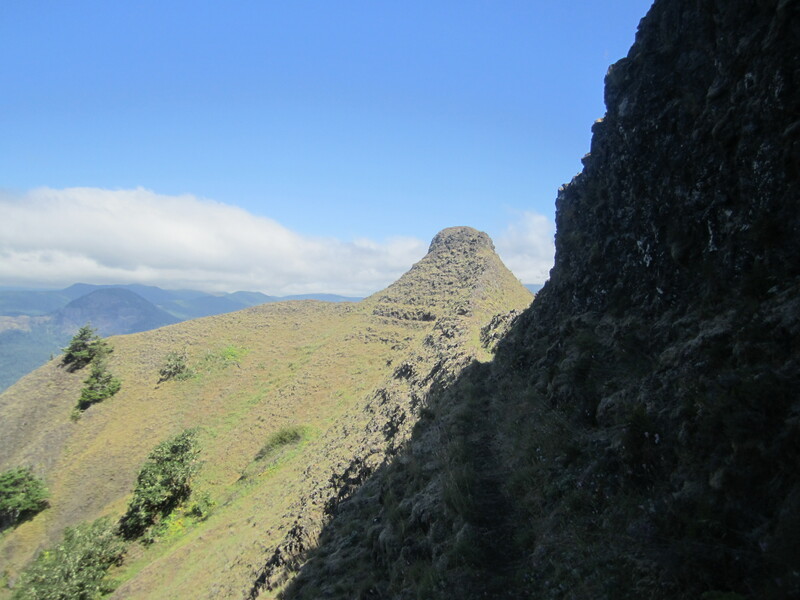 Eventually I traversed back to the path and enjoyed the last of the killer views before clouds cloaked the volcano. 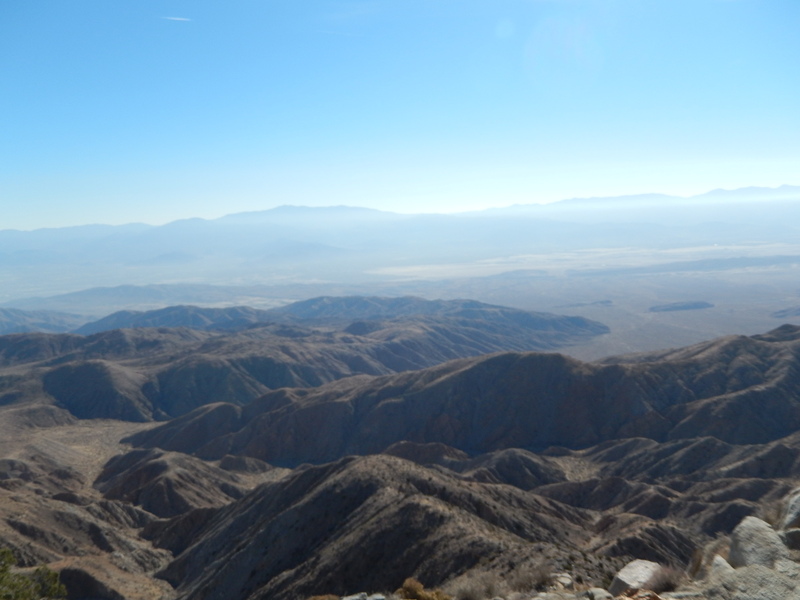 With my scrambles on top of trail hiking, I probably ventured 10 or 11 miles, which is relatively modest, but more than 3000 feet of elevation gain and challenging scrambles made it a very respectable day in the mountains. Back on the Timberline trail. Clouds obscure Mount Hood as I depart. I would be sore the next day, but it was worth it. I hadn’t known what to expect from the terrain. 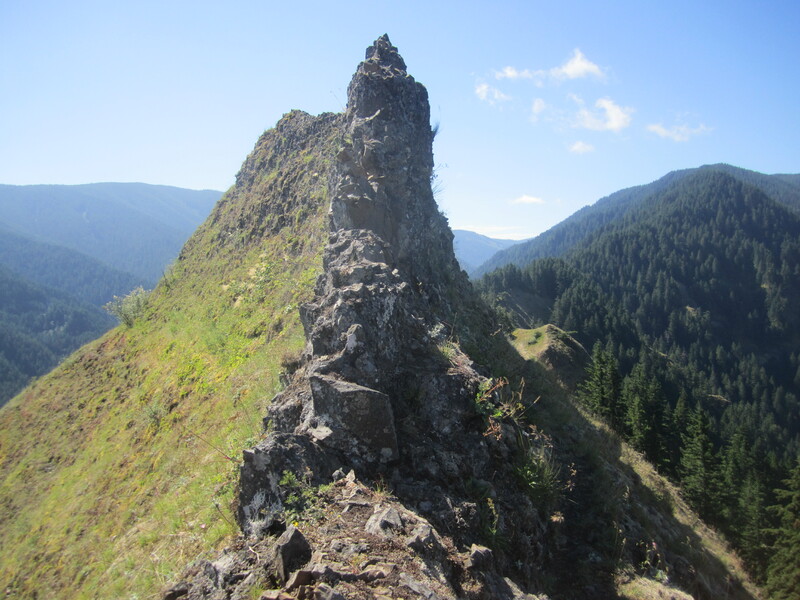 What I found was an experience that fits perfectly in the pantheon of classic Oregon hiking trips. A crow on Cathedral Ridge above McNeil Point on Mount Hood. I’d never heard a crow be so noisy in more than a caw-caw way. 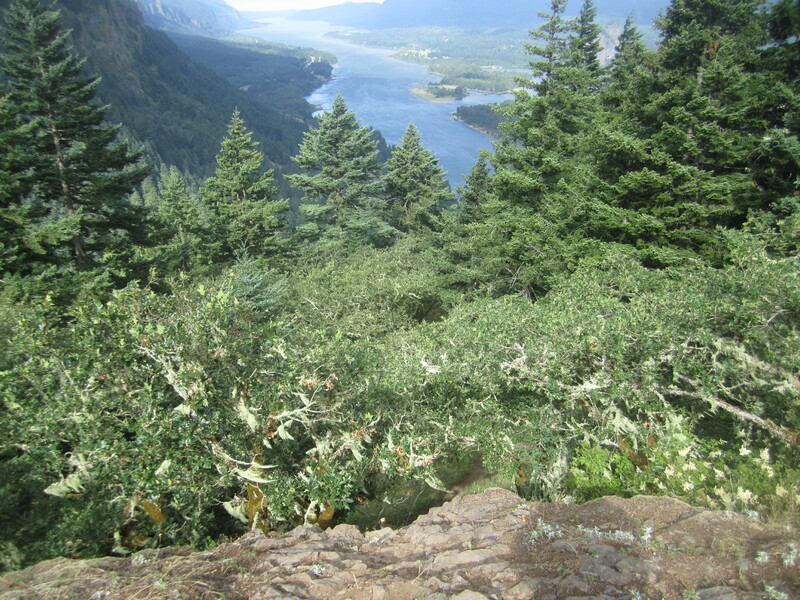 Hiking above the well known McNeil Point shelter led to great scrambling, nasty talus slopes, and various spectacular views. More to come. July Fourth is an interesting holiday. Some people like to stay at home, so they can spend their money on smelly, noisy, and colorful flashbangs in the neighborhood and drink a favorite beverage, perhaps eating some grilled meat along the way. For some, it’s a good day to get outdoors and enjoy mama nature. Call me crazy, but I like to do both. It had been too long since I had had a tough hike, but I only had half a day. 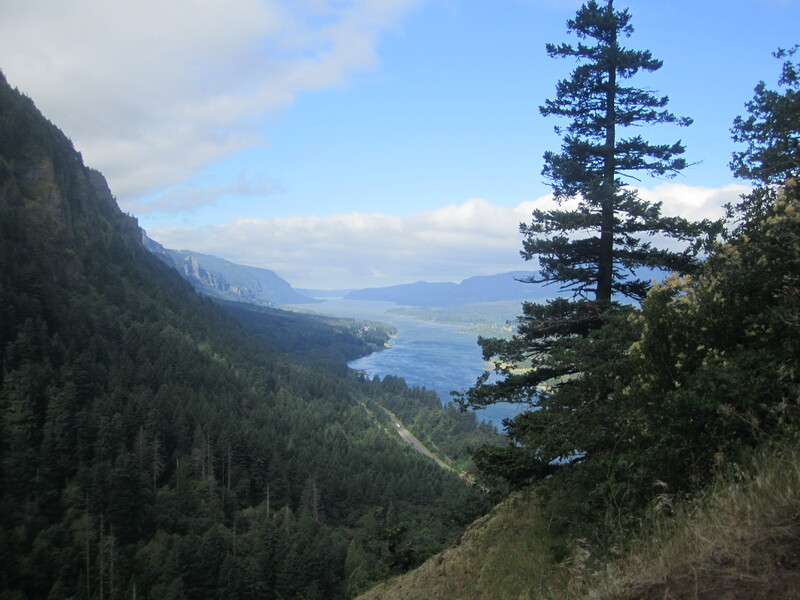 After some research, I picked Munra Point in the Columbia Gorge, accessed off exit 40 on highway 84. It sounded spectacular and challenging for a short hike, and so it would prove to be. 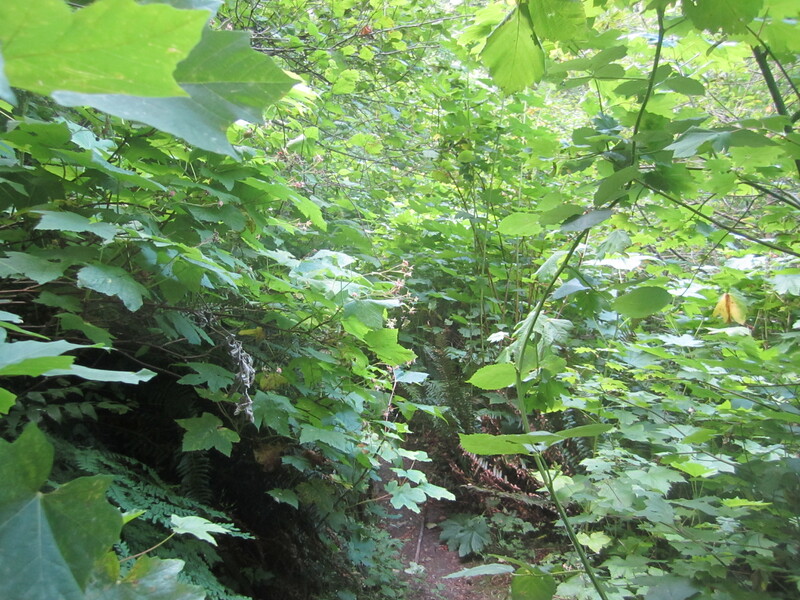 Trail 400 is just a wee bit overgrown: lots of thistles and blackberries. 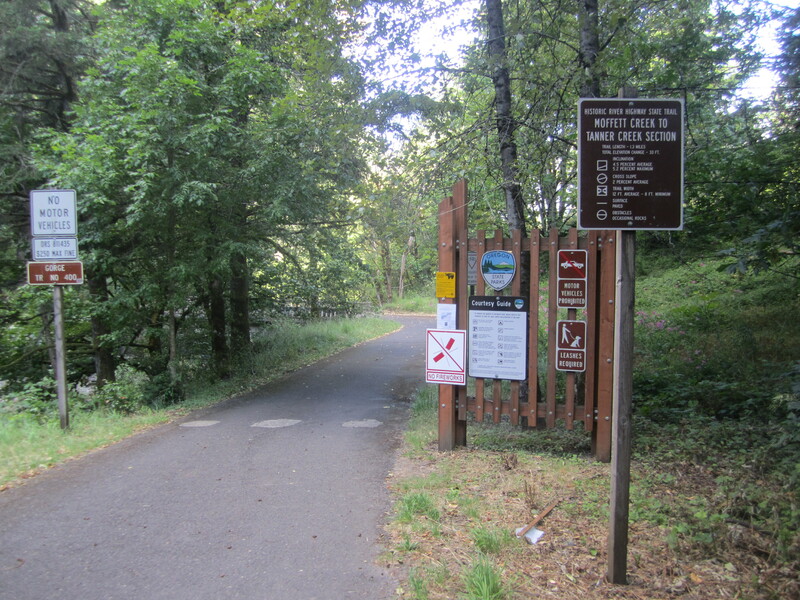 The trailhead is the same spot as the Wahclella Falls trail. 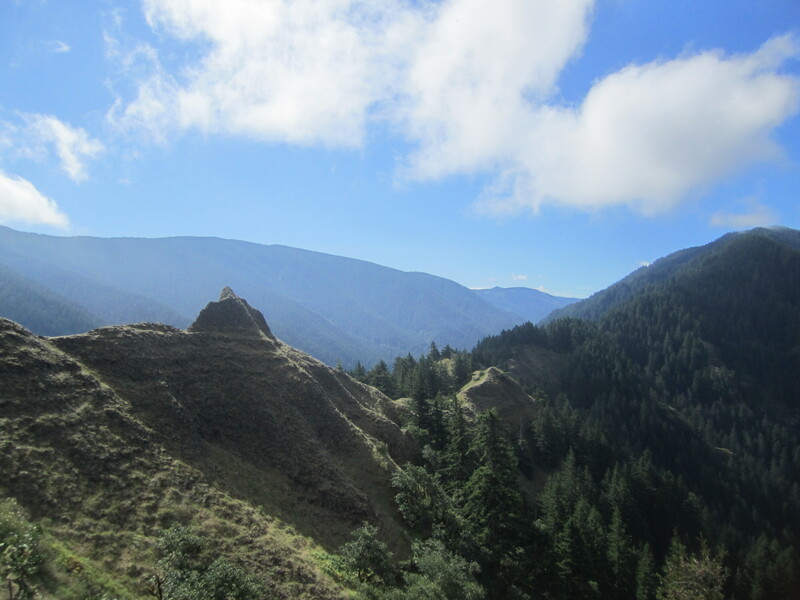 Munra Point has an unofficial trail that peels off of Trail 400 just over a mile to the west, shortly before it crosses Moffett Creek. While unmarked, the junction feels relatively obvious. Thirty or forty feet up the trail, there is a sign on a tree saying “trail not maintained”. 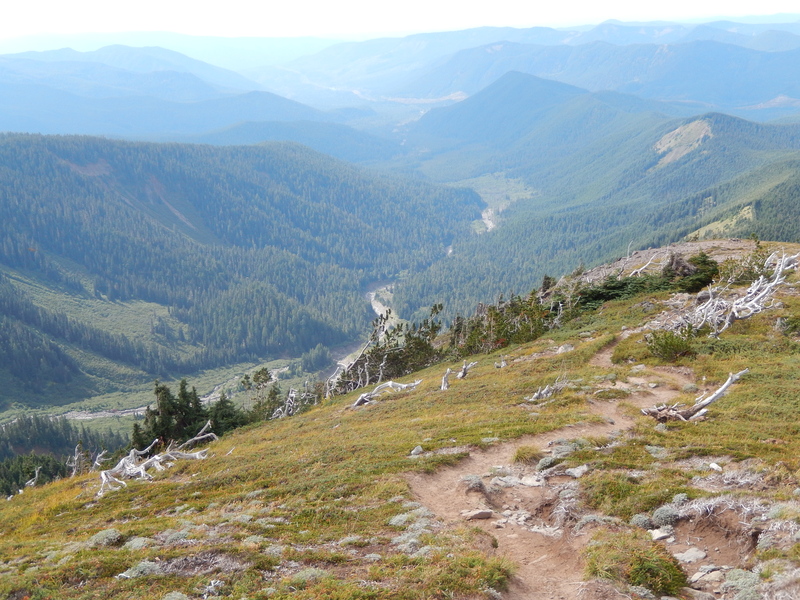 At first, the Munra Point trail climbed steadily like a normal trail, but as it steepened, some of the switchbacks had some slippery to their slope. Unfortunately, people have taken shortcuts, which has made a mess of things in a couple spots, so it’s hard packed dirt with ball bearing grit on top, and the tread is not always flat. 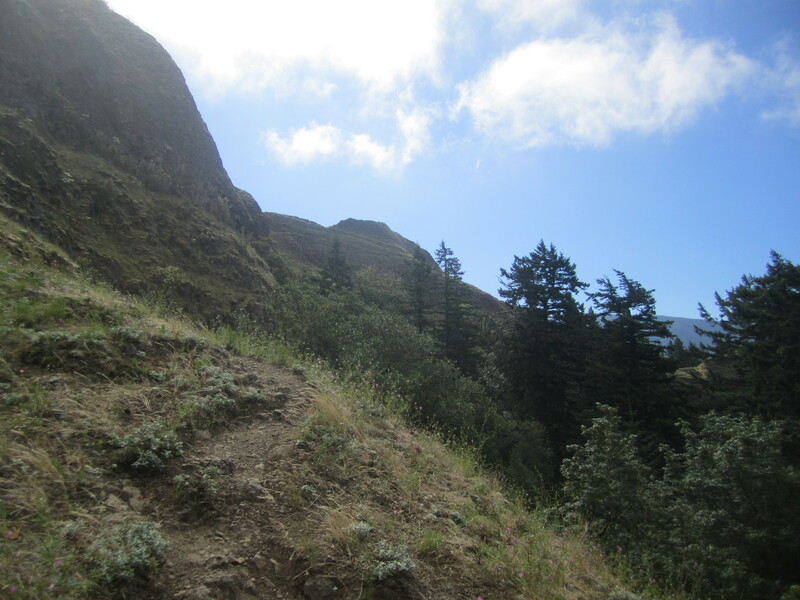 Once you break into the open, there is less chance for this, as the trail gets so steep, there may be only one route possible, and it is much rockier. I had to use my hands to clamber over more than a few boulders and short rocky pitches. Trekking poles be nice in certain areas, an encumbrance in other spots. 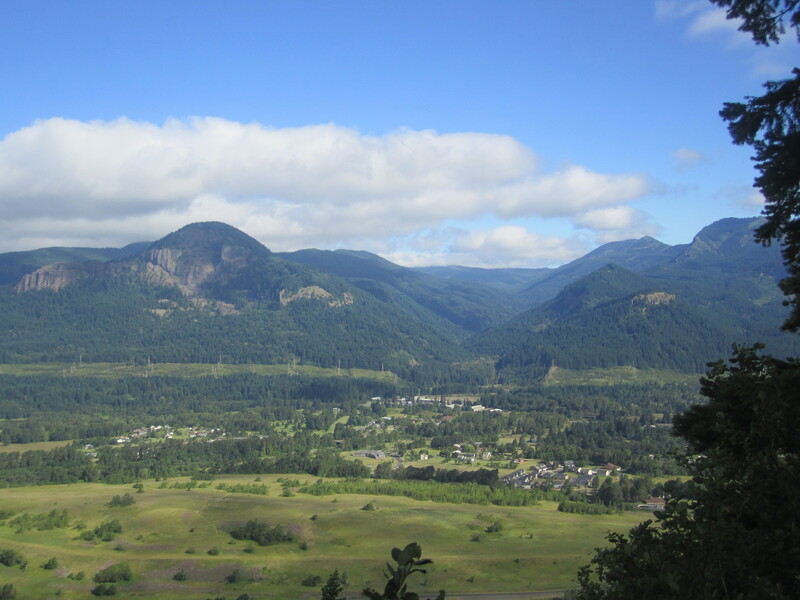 The trail breaks out into the open with views in multiple directions, from Beacon Rock and the River to the west toward Table Mountain, Mount Adams to the Northwest, and what I believe is the mass of Tanner Butte to the south; it is all lovely. 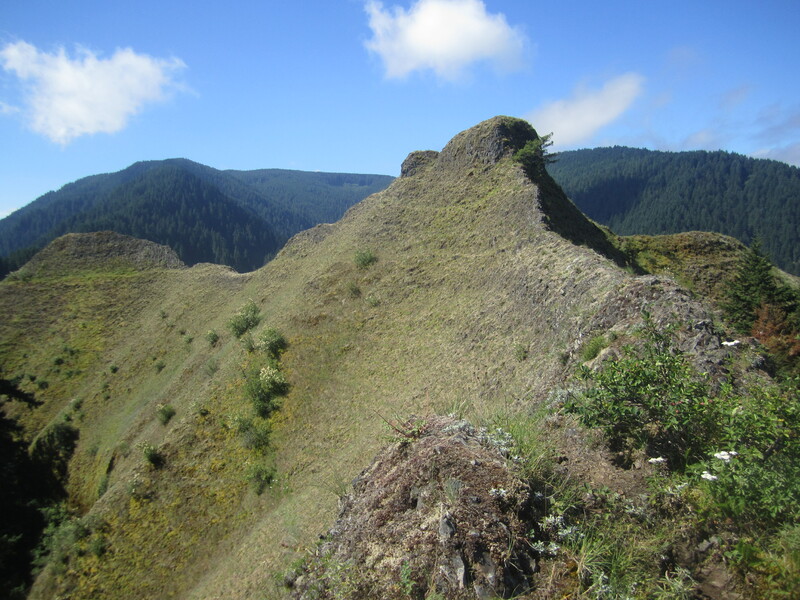 The typical Douglas Fir forest shifted into scrub oak on the more open craggy terrain. Unfortunately, there is also poison oak. The trail is steep, but my pace felt slow. I was pleased to surmount the final rocky gully. Above it, the trees vanished. 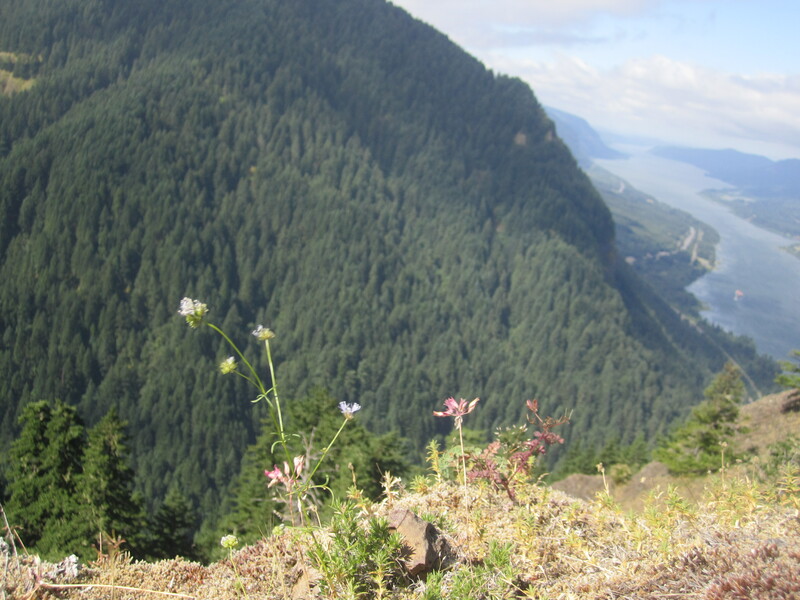 The trail traverses a narrow grassy ridge to Munra Point proper. 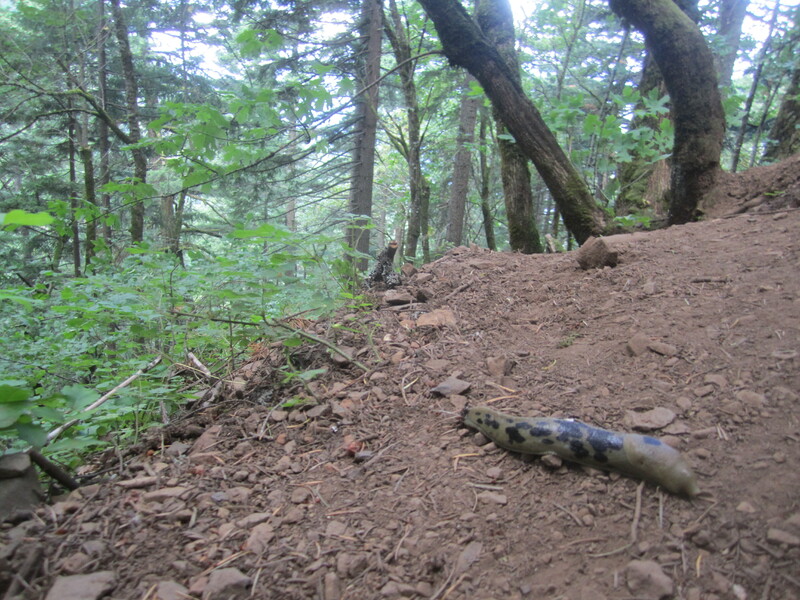 One trip report on Portland Hikers Field Guide suggests the final point is too dangerous to attain, but I did not find this to be the case, although I had to find a spot to sit in a saddle below. Photo opportunities abound. The narrow ridges heading to sub peaks to the northeast and to the south are each trickier, and not for those subject to vertigo. They are well worth investigating for views and geology, or perhaps you’ll enjoy watching and listening to the swallows cruising overhead, whipping back and forth across the ridges. Naturally, the descent is much faster. Trekking poles would have come in handy here. 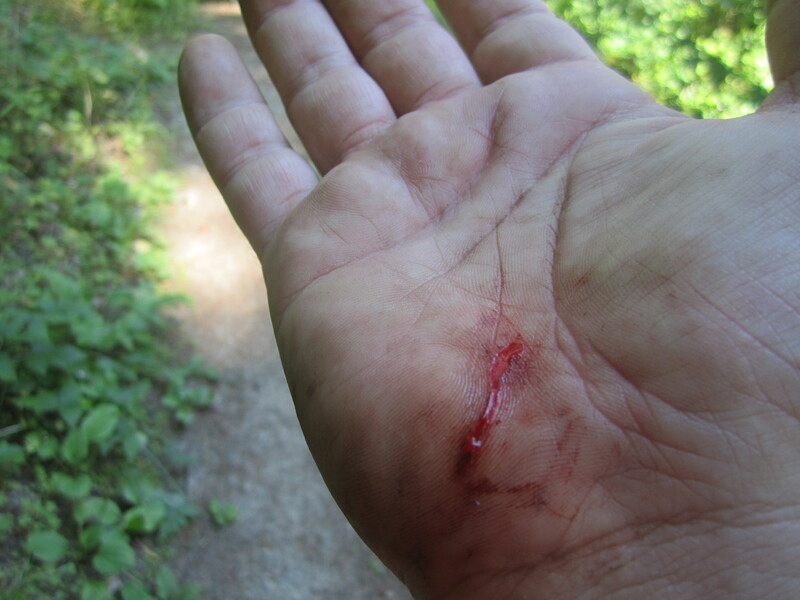 I slipped in a few spots, incurring a gash to my hand near the bottom. Independence requires a price. This one is small. Munra Point is a great short hike for the adventurous, a good start to a day when we all might contemplate our own independence.